Arizona is situated in the Southwest Region of the United States. It is generally sunny and warm. The southern desert areas experience mild winters and dry, hot summers. The Grand Canyon is easily Arizona’s most distinguishable landmark. Arizona has a mix of Native American Indian and Hispanic cultures, and represents the quintessential flavor and essence of the American West. Science museums and vast nature preserves include the Colorado River, the Grand Canyon, Monument Valley, the Painted Desert, the Sonoran Desert and Lake Havasu. The London Bridge, Meteor Crater, city sights of Phoenix, Scottsdale and Tucson are other must-sees. As the state’s attractions are pretty spread out, you will definitely need to rent a car to get around and explore most of it. For more information visit: arizonaguide.com. 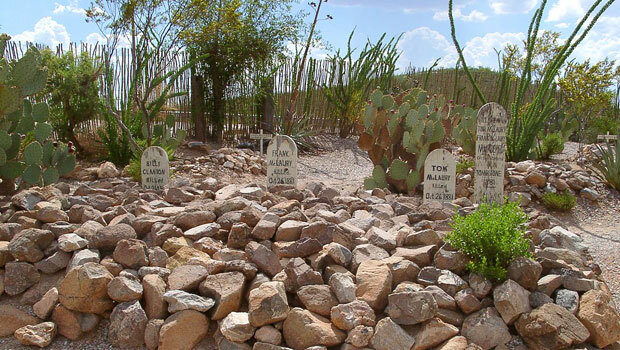 The graves Billy Clanton, Frank McLaury and Tom McLaury in Boot Hill Cemetery, Tombstone, AZ. Photo by Pretzelpaws. Arizona-Sonora Desert Museum is a zoo, natural history museum and botanical garden in one location. Over 300 species of animals and 1,200 plants are on display at the Desert Museum and there are 2 miles of trails through 21 acres of desert. Fort Apache Historic Park allows visitors to experience Apache culture and history with exhibits, photographs, arts demonstrations, tours and special events in White River, Arizona. Montezuma Castle National Monument is the site of some of the best-preserved cliff dwellings in North America where the Sinagua people once lived over 600 years ago. Today visitors can take self-guided tours or attend a daily Ranger talk to learn more about the area and its history. The O.K. Corral historic district in Tombstone portrays the “Wild West” and the infamous “Gunfight at the O.K. Corral.” Reenactments of the gunfight occur daily and visitors can learn about the history of Tombstone, the mining boom and life as a pioneer in the Wild West at the Tombstone Courthouse State Historic Park and other historic sites and attractions in the area. The Queen Mine operated from 1877 to 1975 and contains 143 miles of passageways over seven levels. Today, visitors can take a tour to learn about the history and dangers of the Queen Mine and experience what it was like to work in the mine. The Heard Museum in Phoenix is dedicated to American Indian arts and culture, especially Southwestern cultures. The museum has exhibitions, special events, educational programs and festivals. Artlink First Fridays are a free public event that allows visitors to tour art galleries, cultural venues, studios and other spaces during the first Friday of each month in downtown Phoenix. Shuttles are available from the Phoenix Art Museum. The Scottsdale Museum of Contemporary Art exhibits modern and contemporary art, architecture and design from American and international artists. Performance art, films, educational programs and other events are also held at the museum during the year. In the spring, many professional baseball players come to Arizona for “spring training” practice and visitors can buy tickets to see games in the Cactus League. Stadiums are located in Glendale, Goodyear, Tempe, Scottsdale, Mesa, Phoenix, Peoria and Surprise. Visitors can also watch minor league baseball and off-season players at the Arizona Fall League and Arizona Winter League at a much lower price than professional baseball games. The minor league players sometimes go on to the major leagues, so you may see the next big baseball star at a game! Visit a local university or college to see live American sports games without paying high prices. The University of Arizona and Arizona State University have an intense sports rivalry and any game between the two teams can be very exciting and passionate. Lake Powell. Photo via Pixabay. The Grand Canyon is an iconic attraction in Arizona and it attracts around 5 million people each year. Visitors can reach the canyon using a guided tour, public transportation or in their own vehicles. Once at the park, visitors can try hiking, whitewater rafting, mule trips, camping, biking and running around the North or South rims. The Chiricahua National Monument near Willcox is the site of unique rock formations and a historic pioneer homestead called Faraway Ranch. Visitors can hike along 17 miles of trails, camp, picnic, see wildlife and visit the Ranch to learn about pioneers and Arizona history (check the Visitors Center for tour information). Colossal Cave Mountain Park near Tucson is home to a large cave system and the La Posta Quemada Ranch Museum. Visitors can take tours of the cave and learn about the area’s natural and human history at the ranch museum. Horseback riding, picnics and camping facilities are also available. Lake Powell is the second-largest man-made lake in the United States (Lake Mead is the largest). 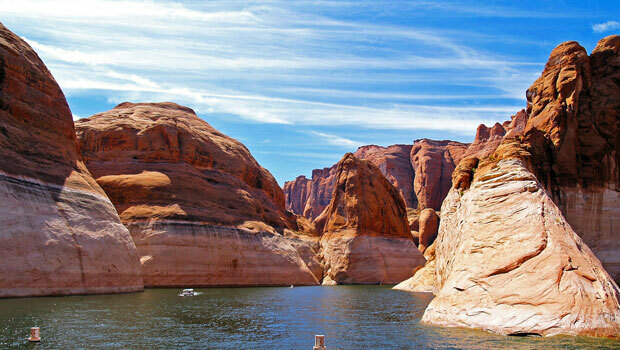 The lake lies within the 1.2 million acres of Glen Canyon National Recreation Area so there are many outdoor activities available, including guided tours, hiking, boating (many people rent houseboats on the lake), mountain biking, swimming, fishing, kayaking and more. Saguaro National Park in Tucson is home to the giant saguaro cactus, a symbol of the American Southwest. 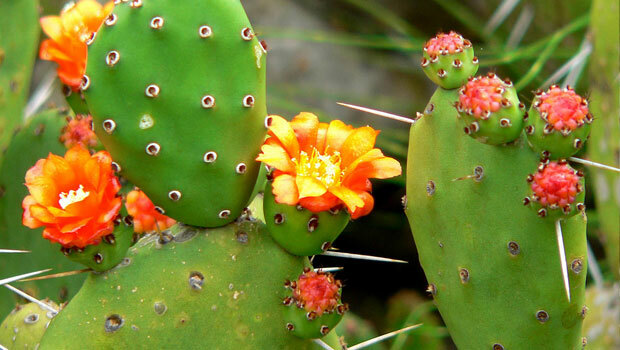 Visitors can see the cacti and also enjoy hiking, bike tours, camping, horseback riding and special events. Visitors may picture deserts and the Grand Canyon when they think of Arizona, but it is also home to skiing and snowboarding areas, including Sunrise Park Resort, Mt. Lemmon Ski Valley, Arizona Snowbowl, Elk Ridge Ski & Outdoor Recreation and Flagstaff Nordic Center. Prickly pear cactus. Photo by Stan Shebs. Arizona’s cuisine is a Southwestern-style of food with influences from Native American, Spanish and Mexican cuisines. Tex-Mex foods, a mixture of both Mexican and American influences, can be found throughout Arizona. Other specialties found in Arizona include tepary beans, yellow-meated watermelon, Navajo-Churro sheep and even Saguaro and Prickly Pear cacti! Visit a local farmers’ market in Arizona to buy fresh fruit, vegetables and homemade products and to enjoy a community event. Gold Rush Days is an annual festival in Wickenburg that celebrates the town’s mining and ranching heritage. The three-day February event includes a parade, rodeo, Western barbecue, arts and crafts, food vendors and a gold panning contest. The Phoenix Film Festival in April screens over 150 films each year and attracts over 20,000 film fans. Feature films, documentaries and short films are screened at one location in Phoenix and special events, like lectures and parties, are also held during the festival. Tempe Festival of the Arts showcases the arts and crafts of over 400 artists over a three-day weekend in April. The festival also features live music, food vendors, wine and beer festivals and more. The Navajo Festival of Arts & Culture shares the work of 75 Navajo artists, traditional music and dance performances, traditional food, and lectures about Navajo history and heritage each August at the Museum of Northern Arizona in Flagstaff. The Arizona State Fair in Phoenix attracts more than a million visitors over several weeks in October and November. The fair has carnival rides, food vendors, live concerts, contests and other fun events. Browse the Arizona events calendar to find the latest cultural fairs and festivals each week. Phoenix: Valley Metro RPTA operates local and express buses, light rail services and rural bus routes in the Phoenix area. Tucson: Sun Tran operates a bus system in the greater Tucson region. A street car system is also being built in Tucson, due to open in late 2013. For other public transit systems in Arizona, visit the American Public Transportation Association website. Greyhound buses travel throughout Arizona, including stops in Phoenix, Flagstaff, Yuma and Willcox. Amtrak routes – the Southwest Chief, Sunset Limited, Texas Eagle – travel to destinations in Arizona and connect to surrounding locations in Texas, New Mexico, California and as far as Chicago in Illinois. Habitat for Humanity helps build homes for families in need and uses volunteers at all house builds. No particular skills are required to volunteer with Habitat for Humanity and both individuals and groups can sign up. Find a local affiliate in Arizona for more information and to start making a difference. Help out at the Phoenix Marathon in March for a fun, short-term volunteering opportunity. Both individuals and groups are welcome to sign up as volunteers. Volunteer with an Arizona food bank to help feed Arizona communities. One-time and short-term volunteers are welcome to sign up for a few hours and no experience is required for most volunteer tasks. Volunteer Southern Arizona and HandsOn Greater Phoenix help connect volunteers and organizations in need of help. Use the online search engine to find a volunteer opportunity that matches your location, interests, skill level and time availability.